Robometricschool. 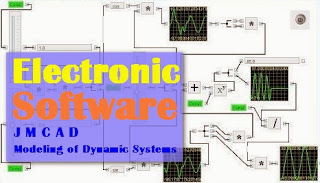 - Although still foreign in electronic design and create, but in here we will also show you information about software JMCAD - Modeling of Dynamic Systems that also categorized as Computer Aided Instruction that also can used to electronic simulation. In here we will share with you about JMCAD - Modeling of Dynamic Systems and also will give you link to free download JMCAD - Modeling of Dynamic Systems from Robometricschool blog here. In here we will not give you complete information about JMCAD software, but only globally because from the link you will read all the information of this software. JMCAD is an program for the modeling and simulation of complex dynamic systems. This includes the ability to construct and simulate block diagrams. The visual block diagram interface offers a simple method for constructing, modifying and maintaining complex system models. The simulation engine provides fast and accurate solutions for linear, nonlinear, continuous time, discrete time, time varying and hybrid system designs. With JMCAD, users can quickly develop software or "virtual" prototypes of systems or processes to demonstrate their behavior prior to building physical prototypes. The user builds his system model by selecting predefined blocks from a block library and simply wiring the blocks together. Each block of the diagram performs a function. Users can also create custom blocks in Java and add them to the JMCAD block library.